Shortly after arriving in Camargue, Susannah is rescued from wild bulls by a mysterious man riding a white horse. Susannah soon learns that her savior's name is Grey Dempsey - a local rancher whose free-spirited Gypsy wife had left him and their daughter Sari five years ago. As Susannah continues to stay on the island and spend time with Grey and Sari, she realizes that Saint Sarah may just have led her to a new home and family. At first, I wasn't quite sure I could get into Light of the Moon, since for some reason, reading about ranches and horses has always bored me to tears. But after reading the part near the beginning where Grey saves Susannah from the bulls, I found myself being drawn in to the story and couldn't stop reading. I think I ended up speeding through this book in just under three days. 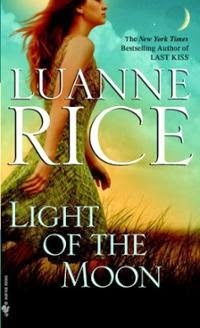 What I appreciated most about this book was the detail and research invested on behalf of Luanne Rice in Saint Sarah and the entire Camargue region. It's evident through the reading that either Rice spent a significant amount of time in the Camargue, performed thorough research on the area, or did both. Regardless, I found the novel so interesting that I took extra time to look up images and more information about Saint Sarah and the Camargue. Overall, I was incredibly pleased with Light of the Moon, and I've been thinking often of Saint Sarah since I finished this novel almost two weeks ago. This one is very well done!